Merritt College alumnus and Marin County Deputy District Attorney Otis Bruce Jr. has seen a lot change since his childhood days working on his grandfather's farm in Mississippi. Much of what has changed in Bruce's life can be attributed to the many firsts he has taken part in. In 1989, he became one of the few African-American legal assistants to work in Marin County; in 1995 he became the county's first black prosecutor; and in 2011 the first African-American or ethnic minority president of the Marin County Bar Association. His efforts have radically reshaped and influenced the opportunities available to black lawyers, legal assistants and law clerks, opening doors of possibility for other firsts and definitive change within the legal system. When Bruce accepted his position as the first African-American president of the Marin County Bar Association, he asked his fellow lawyers to become "an agent of real change. You're the true harbingers," said Bruce, "the guardians of what is supposed to be right, righteously defending those who don't have rights and defending those who are underprivileged." Those weren't just empty words from Bruce, who has been the epitome of change in an era marked by transition. animals were fed. Bruce and his brother, Norris, also carried water from his grandfather's property to their home so his mother could prepare food and wash in the afternoon. Life on the farm wasn't always easy, but it taught Bruce when the time for change is ripe, and when to wait on the harvest.Bruce and his grandfather were extremely close, and Patterson inspired a young Bruce to pursue his dreams. "Spread your net wide and deep," his grandfather used to say, "You get more fish that way." Bruce never forgot that advice.Born in SoSo, Mississippi, a rural town of fewer than 500 people, Bruce was the eldest of six children and quickly developed a sense of responsibility as he cared for his siblings while his mother, a domestic worker, struggled to fulfill her resolve to provide for them. When he was eight years old his parents, Otis Bruce, Sr. and Thomasine, separated. His mother moved the family into a small, three-bedroom house to be near her father, a share cropper named George "Sport" Patterson. "We did not have the conveniences of a bathroom and running water," said Bruce, "but we knew our mother loved, cared and struggled to provide for us. She never let us know we were poor." In 1971, another first was about to enter Bruce's life. For most of his elementary school years, he attended Shady Oaks Elementary School, a small, segregated school in his rural hometown, where Bruce was taught by several black elementary teachers who also taught his mother and father. During the summer, as he prepared to enter junior high, Bruce also had to prepare for integration into the previously all white West Jones High School, 18 miles away in Jones County, outside of Laurel,Mississippi. Before the end of segregation, as far as Bruce was concerned, the most important thing in life was family and his community. He had interactions with the whites of SoSo and the Choctaws of Mississippi, but the groups rarely mixed. Integration changed that, and Bruce came face-to-face with the harsh realities of the Deep South. By age 14, Bruce was already dreaming of becoming a lawyer. He learned to value service by helping his mother, grandparents and the other senior citizens in his community. He was called upon regularly, as a young man, to speak in church. He was very active in sports and focused on his academics, remembering his grandfather's words of wisdom to "stand up, speak up and shut up." "I gravitated toward the idea of service and committed to one day being able to help my family and the people of my community in SoSo,Mississippi," says Bruce. "During my childhood, I saw a need in my local community and vowed that I would one day be a lawyer serving the community." After graduating from high school, and inspired by one of his mentors and history teacher-coach Cleveland Payne, Bruce left the rolling fields of rural Mississippi for the crowded streets and city lights of Oakland,California. He saw in the Bay Area an opportunity for ethnic minorities, and a need for black lawyers to move into new areas. Without any money for college,California also fit the bill, providing educational opportunities if he applied himself. Some doors to opportunity needed to be opened, but others simply walked through. In either case, Bruce knew where he needed to be and made the change. Upon arriving in the Bay Area, Bruce enrolled in classes at Merritt College where, under the tutelage of faculty member Ken Giles, he studied criminal justice administration, earning his associate of science degree in 1979. He speaks fondly of his time at the Peralta Colleges, and claims that without Merritt College there wouldn't have been any opportunities for him, crediting the community college with putting him on the road to success and the first of 36 grandchildren in his family to receive an advanced degree. While holding down two part-time jobs, Bruce did well academically at Merritt College, and transferred to San Jose State University to continue his studies in criminal justice administration. Originally intending to become a police or probation office in order to pay for his law school education, he met two mentors at San Jose State, counselor Bill Carter and African-American Studies Professor Michael Millner, who encouraged Bruce to carry forward his grandfather's wisdom and pursue his dream of becoming a lawyer. Bruce earned his bachelor's degree in 1981, and began his formal legal training at UC Hastings College of the Law. He tried to continue to work and attend law school, but financial difficulties and family commitments forced him to withdraw. But Bruce persisted, and a few years later, following his dream, he was accepted to the New College of California School of Law (now part of the John F. Kennedy University School of Law), the oldest public interest law school in the United States. In addition to his part-time legal studies, Bruce continued to work full-time to support his children and family. He graduated with his juris doctorate in 1987. "After law school," says Bruce, "I decided that I could better fulfill my interest in public service and serve the community as a trial lawyer with the District Attorney's Office." Inspired by the example of Dr. Martin Luther King Jr. to seek opportunities and justice and pursue change in places where opportunities existed, he moved his family to Marin County. Without any connections, he sought out a career in Marin. "Once in Marin," recalls Bruce, "I found out there were no African-American government attorneys in Marin County. . . I started working in Marin County as a volunteer law clerk with the Marin County Counsel's office. I was literally a 'walk-on county employee' - I just walked into the County Counsel's office and asked Doug Maloney for a job. I was later hired as an extra-hire (contract position) legal assistant with the Marin District Attorney's Office in 1990. In 1995, I was hired as a full-time deputy district attorney by then District Attorney Jerry Herman, and made history as Marin County's first black prosecutor." "Because we were new to the community, I sought out mentorship from the late Harold "Hal" Brown, Jr. (former Marin County Board of Supervisor), Joan Brown (former Marin County Volunteer Coordinator), Betty Times (Marin City Community Leader), Glenn Robinson (former U.S. Marshall-Northern California), Vernon Crawley (former Marin County Equal Employment Officer) and retired Marin Superior Court Judges William Stephens, Peter Allen Smith and Vernon Smith," said Bruce. Working and living in MarinCounty, Bruce was compelled to become more involved with his community. Just as he did during his young days inMississippi, he reached out as a volunteer. Bruce has served on many Marin boards and community organizations, including the North Bay Children's Center, American Red Cross, College of Marin Foundation, Marin Association of Public Employees, Friends of Margarita Johnson Senior Center, Terra Linda Rotary Board, Marin Community Foundation Community Partnership Committee, and the Performing Stars of Marin "Boys to Men" Program for which he received the Martin Luther King Jr. Humanitarian Award in 1994. One of Bruce's greatest accomplishments within his community was as the head coach of the Novato Pop Warner Football team, and the difference he made in the life of Billy McKie. "I am very proud of my mentorship to the many young men in Marin through sports and academics," Bruce commented. "Several have gone on to become successful-academically and professionally. I am very proud of the life lessons I've been able to share." McKie was in danger of falling through the cracks of the Marin educational system. With little interest in school, he was headed forCountyCommunitySchoolinSan Rafael, an alternative for youth with behavioral and attendance problems. "It was the lowest point in my life," said McKie, "I was always getting into trouble, ditching school and not really caring about anything at all . . . Then I met Coach Bruce." McKie names Bruce as his "greatest inspiration" and the one person who saw his potential. Together the coach and student took their football team to a Pop Warner Division 3 national title in 2001, and McKie was able to return to high school where he boasted a 3.3 GPA in his senior year. Bruce inspired change in McKie. He planted the seeds of confidence and determination that are the roots of McKie's success. "I always think back to Coach Bruce," McKie says, "He gave me so much drive. He taught me about responsibility, to not take anything for granted." 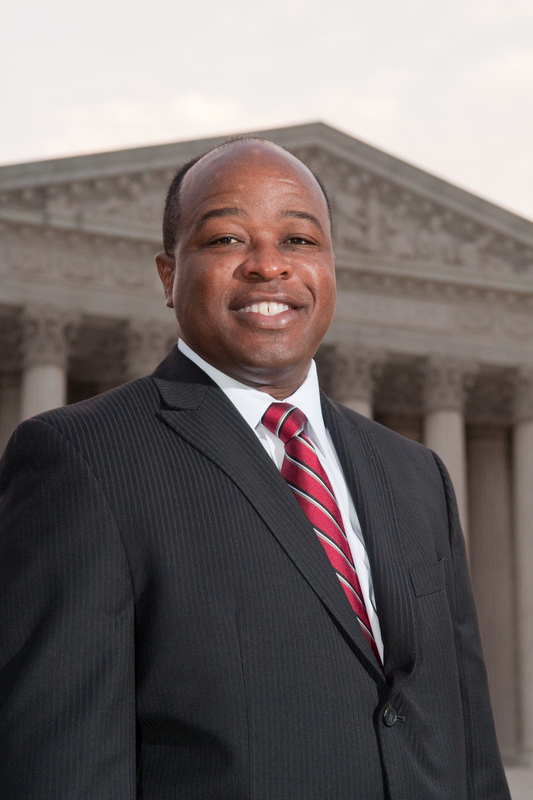 In addition to his commitment to the community, Bruce feels a special responsibility to other black lawyers. So when he was invited to serve as Southwest Regional Director of the National Black Prosecutors Association (NBPA), the only professional organization for the advancement of blacks as prosecutors that boasts over 800 members nationwide, Bruce jumped on the chance. As regional director, he continued to push the boundaries of what it means to be a black lawyer inAmerica. In late 2010, Bruce and 10 other members of the NBPA made history once again as the first group of African-American prosecutors to be sworn in as officers before the U.S. Supreme Court. "We stood one by one as Judge Burnett pronounced our names," Bruce recalls. "We were very close to the bench - at least ten feet. My eyes peered from left to right as I looked directly in the faces of Justice Sotomayor, who showed a warm smile, and Justice Thomas. The Clerk of the Court, General William K. Suter, instructed us to raise our hands and we took the oath . . . It was over shortly after it had begun. But the impact will never fade." When the moment was over, Bruce began to reflect on the more than 200 years of history made where he was standing. As a black prosecutor being admitted to the U.S. Supreme Court, he was moved by the significance of taking the oath in the same space where the Dred Scott Decision was announced in 1857 that declared African-Americans non-citizens, unprotected by the constitution. Or, Plessy v.Fergusonin 1896 that upheld the constitutionality of segregation until it was overturned, in the very same room, by Brown v. Board of Education in 1954. It's no wonder Bruce calls the experience an event to cherish and one of the highlights of his legal career. From a farm boy in rural Mississippi to an officer of the U.S. Supreme Court, the change that Bruce has enacted in his life is undeniable. Despite all his accomplishments, rest was not in the cards for Bruce. Only a few months after his swearing in at the Supreme Court, Bruce again made history as the first African-American and ethnic minority to serve as president of the Marin County Bar Association in its 76-year history. From the rural, segregated South to the halls of our highest courts, Bruce has lived up to his promise to be an agent of real change. As a young boy, he witnessed the constant advances of nature, the transformation from seed to growth and harvest. As a man, he challenged society and transformed lives, blazing his own trail through the frontiers of the American landscape to pursue opportunity and justice. Reflecting on his life to this point, Bruce only offers a few words, "true faith, belief, tenacity, education, networking and commitment-that's it."